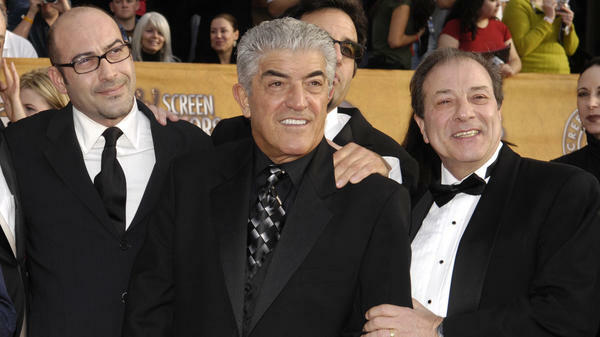 Frank Vincent, seen here in 2007 with colleagues from The Sopranos, has died in New Jersey. Frank Vincent, whose portrayal of New York mob boss Phil Leotardo made him a mainstay on HBO's The Sopranos, has died. His career included films from Raging Bull and Goodfellas to Do the Right Thing. "Our family will never forget the Leotardo legacy," HBO wrote Wednesday night, posting a photo of Vincent smiling and smoking a cigar. The actor "died peacefully on Wednesday, a statement from his family said," according to The Associated Press. No cause of death was immediately announced — but Vincent reportedly endured a heart attack recently, and the NJ.com site says he underwent heart surgery Wednesday. Family members told the AP that Vincent was 80; other sources have listed his age as 78, saying he was born in 1939. His official bio page does not provide a birth year. With his strong chin, manicured hair and steely glare, Vincent could bring an air of menace to almost any atmosphere — an ability that he later played off of in cameos in rap music videos and ads for light beer. Vincent's gruff voice was so indelible that it was featured in the video game Grand Theft Auto, where he played Don Salvatore Leone. Portraying Billy Batts in Goodfellas, Vincent delivered one of the most memorable lines of the gangster genre, when he ill-advisedly told Joe Pesci's Tommy DeVito, "Now go home and get your f***in' shinebox." The two actors had a long history: They started out playing music together in nightclubs, with Pesci on guitar — and eventually they realized their outsize personalities were captivating audiences. Their band name? The Arist-o-cats. "We were like the Smothers Brothers," Vincent told NJ.com. Vincent made his film debut alongside Pesci in 1976's Death Collector, and they parlayed that low-budget movie into key roles in Martin Scorsese's 1980 masterpiece Raging Bull — in which Pesci's Joey LaMotta administered a savage beating to Vincent's Salvy Batts inside and outside a club. It was one of a string of films in which Vincent had important roles along with Pesci. Together, they brought a sense of unpredictably violent reality to Scorsese's films featuring Robert De Niro, including in 1995's Casino. Vincent also acted in two Spike Lee films: 1989's Do the Right Thing and 1991's Jungle Fever. Born into a family of Italian-Americans in North Adams, Mass., Frank Vincent Gattuso Jr. was raised in the Greenville section of Jersey City, New Jersey. His initial approach to the arts came through music — he was a drummer who played in both clubs and recording sessions, where he backed artists such as Paul Anka, Del Shannon and Trini Lopez, according to his biography. Vincent went on to appear in dozens of feature films and TV shows.